Written on: Mar 25, 2014 by Fran. This article received 6 kudus and has been read 2,909 times. Beautiful landscapes, friendly people and plenty of big five wildlife reserves – these are the things that attract people to South Africa. But beneath this peaceful and delightful layer, a matter of wildlife cruelty has been hidden. People across the world, including South Africans themselves, are entirely oblivious to the thousands of lions kept in small captive space in this country, for one sole purpose: captive hunting. But the Campaign Against Canned Hunting (CACH) came and turned this into a global public concern. There is urgency to the matter: lions, the king of African wildlife, are already extinct in 26 African countries. Those that remain are facing increasing survival threats. CACH founder and director, Chris Mercer, talked to YAS about their work, the recent global march against canned hunting, and how CACH hopes to put an end to this lion welfare crisis. Guaranteed killing is the greatest distinguishing factor of canned hunting. CACH believes that canned hunting is “essentially the factory farming of lions,” says Chris. Lion cubs are often hand-reared and accustomed to human handling prior to handing them over to hunters, both experienced and inexperienced. Are you realizing how cruel canned hunting is yet? When the time for hunting comes, the lions remain within an enclosure - there is no escape. To make matters worse, the canned lion hunting industry in South Africa is known for drugging lions before the kill, guaranteeing an easier kill, even for the inexperienced hunter. The popularity of South Africa’s canned lion hunting industry has increased significantly among international hunters. CACH reports that in 2012, the total lion trophy imports to the United States were 423. This is shocking, considering there are only 2,700 wild lions in South Africa left. The figures worsen: it is believed that the canned hunting industry is keeping at least 8,000 lions captive in South Africa. The price paid for canned hunting is also astounding, with the price for females averaging around $6500 USD and males fetching as much as $55,000 USD. Why does canned hunting take place only in South Africa? “Canned hunting is only taking place in South Africa,” explains Chris. Why? “The reason is South Africa’s level of development. This is not Tanzania where you could walk for a week without coming across a fence. The entire of South Africa is fenced off. South Africa is the only country, as far as I know, which has a developed industry of actually breeding lions in captivity, for no other purpose but to be shot in enclosed spaces by hunters,” says Chris. Previously, the South African Minister of Environmental Affairs & Tourism tried to impose a restriction on canned hunting in South Africa, but this was successfully challenged by the hunting and lion farming industry – on claims that business would suffer. In other parts of Africa, where lions are free roaming, the situation is different. Unlike in South Africa, the free roaming nature of lions in other African countries allows these animals a chance to escape the hunter. This is a very far cry from South Africa’s canned hunting business. The world took notice on the 15th March 2014 when the first-ever global march against canned hunting took place. An impressive 62 cities across the world participated. Virtually every continent in the world took part: Africa, Asia, Australia, Canada, Europe, Middle East, New Zealand, South America and the United States. In the United States, citizens of Austin, Charleston, Chicago, Columbus, Las Vegas, Los Angeles, New York, Washington DC, Seattle, Tampa, Sacramento and Phoenix showed up in protest. With this global march, “we’ve educated people” says Chris. There were hundreds of march organizers all over the world. Initially, they knew very little about canned hunting other than the immense cruelty. Now, there are hundreds of people across the world that are quite capable of standing in front of a press journalist or cameraman, debating the issue intelligently. “This is what we’ve achieved with the global march and associated information sharing and education. The global feedback was unbelievable. In simple terms, this global march exceeded our wildest expectations,” says Chris. CACH believes that South African government should ban any further breeding of cubs. “We know that the South African government will not ban canned hunting outright…because then they will be sued for financial loss by the hunting industry and lion farmers. There would need to be a phasing out period of several years, allowing the industry and farmers to adjust,” explains Chris. In the meantime, CACH is working on two other potential solutions which can alleviate canned lion hunting. Chris explains these two other solutions: “we need to get a ban on the import of trophies from Europe, and we need US Fish & Wildlife to raise the status of lions to endangered.” The solution is clear-cut. According to the American Endangered Species Act, once lions are endangered, hunters will not be allowed to import their trophies. In asking about CACH’s progress in closing on their two international targets, Chris explains that organizations such as the Humane Society of the United States are campaigning vigorously for this. In fact, US Fish & Wildlife is currently considering input from various parties as part of their evaluation. “However, we also know that the international hunting industry is fighting us. The international hunting industry will probably outspend us…it is not unlikely that the US Fish & Wildlife will surrender to the hunting sector’s lobbying,” says Chris. The importance of educating tourists and responsible tourism should not be underestimated in the fight against South Africa’s canned lion hunting industry. “So many international and local tourists are falling prey to so-called reserves offering lion cub petting. Lion cub petting is a key aspect in the canned lion’s life, and it is a sure way how lions are accustomed to humans, making the kill all the crueller,” warns Chris. The same counts for any reserve or park offering a “walk-with-lions” experience…these are in fact lions being reared for canned hunting. International volunteers hoping to contribute to wildlife management in South Africa are also warned. Do not be caught thinking you will be working on a wildlife reserve necessarily – there are many lion farms in South Africa where lions are kept captive, in entirely undesirable circumstances with volunteers in fact contributing their time and effort to canned hunting. Lions are a symbol of strength, hope and might in Africa. But at the hands of international canned hunters, Africa’s lions are falling from their place of strength and might – fast. If the roaring wild lion is taken away from Africa, there will surely be no hope left. 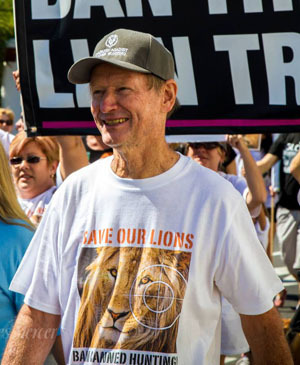 CACH’s founder and director Chris Mercer concludes that they will continue to fight for the plight of lions until the very end, and urges the international public to do the same, tirelessly and with all hope. Photographs used with permission of the photographer, Charles Mercer. Seeing beyond the average tourist routes and experiencing local life is my type of travel! Living in South Africa I'm an environmentalist at heart, and I continue to marvel at the beauty of the African continent. In canned lion hunting, lions are hunted in small spaces after being hand-reared and accustomed to human handling. Canned hunting fees for female lions average around $6500 USD. Canned hunting fees for male lions can be as high as $55,000 USD. The Campaign Against Canned Hunting CACH) is turning this around. The Global March Against Canned Hunting took place of 15 March, forcing government authorities to take note. CACH tells how they want to bring an end to canned hunting induced lion cruelty.